Windows 8 has changed my worlds. The difference is like day and night. Literally. Credit doesn't go to Microsoft. Quite the reverse. From the day I got my PC set up, some four or five years ago, I was very happy with how things looked running under Windows 7. Everthing worked first time out of the box and I didn't really change all that much. When I upgraded a lot of stuff, including the graphics card, a couple of years back, again I just went with whatever the installation required and left it at that. Windows 8 put a stop to such complacency. As I mentioned yesterday I was deeply dissatisfied with what Win8's drivers did to the look and feel of... well, everything. That led me back to AMD's Catalyst drivers, which I always used to use before I got lazy but which I hadn't bothered with for the lifetime of the current machine. 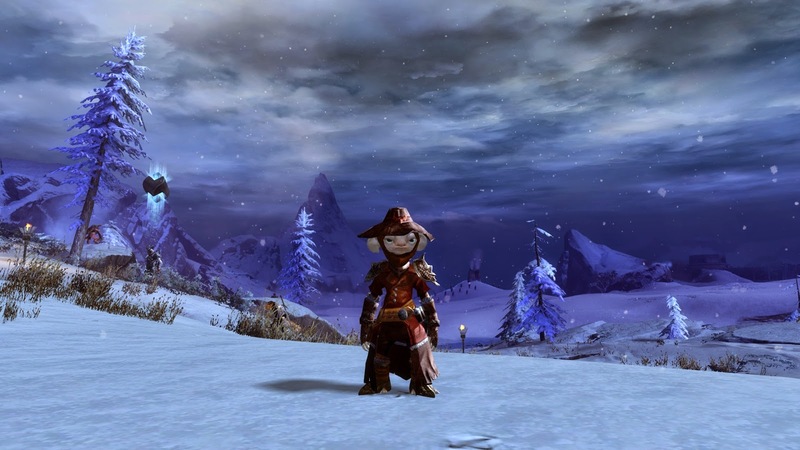 I played two MMOs last night: GW2 and ArcheAge. The change was unmistakeable. In my time in Tyria I've become used to traveling through a soft-focus, watercolor world. My tentative explorations of the Western Continent, Nuia, revealed a similarly impressionistic approach. Overnight, it seems, the expressionists have taken over. Edges seem sharper, shadows seem darker. Where there were snowfields I now see patches of fissured ice. Cliffs that reared up soft and chalky now brood in chiaroscuro grandeur. Everywhere details stand out. There's a lot more stitching and etching than I remember, that's for sure. All that's not totally unexpected. These are the kind of things you can sometimes get when you change the settings. Also you do look more closely when you've changed things. What I didn't expect is a complete revision of aspects of what you might call the graphical gameplay. Back in beta, when you died in Tyria, the world turned monochrome. It was a feature familiar from other MMOs, notably World of Warcraft, which is why, I imagine, it got changed. For the whole two years that the game's been Live the world has looked as bright and cheerful when my characters are lying face down in a pool of their own blood as when they're up and about gamboling among the flowers. I was defending the Honor of the Yak last night and even though the Yak is rampant right now I still found plenty of opportunities to get myself killed. At first thought I was imagining it but soon it became impossible to deny: when my characters die the world fades out. Hints of color remain, albeit with the brightness leached out, but mostly it's shades of grey. I thought maybe it was a WvW change, perhaps related to the recently-added five-minute release timer but no - I asked Mrs Bhagpuss and her characters still look out at a world full of color when they die (which happens to hers a lot less often than it happens to mine but still often enough to prove the point). I could swear I remember the actual patch notes from beta when that feature was removed. Am I making that up? Has everyone else been seeing grey all along? Or is it some kind of fresh graphical bug I've dodged until now by not updating my drivers? 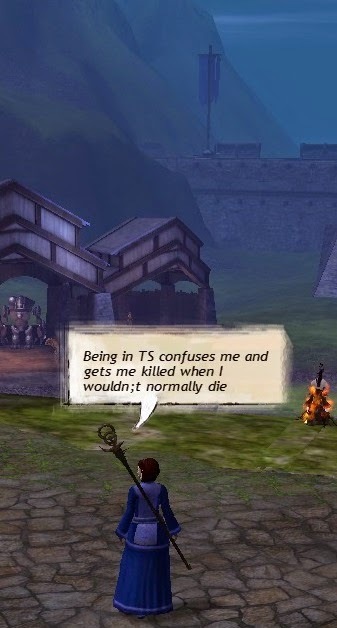 I was still mulling things over when I moved across to ArcheAge. It would be nice to say that light suddenly dawned but in fact it was exactly the opposite. In the course of knocking off a couple of levels, picking up my first Glider and having an all-round fun time I noticed something unusual: about half of my adventures were happening in the dark! 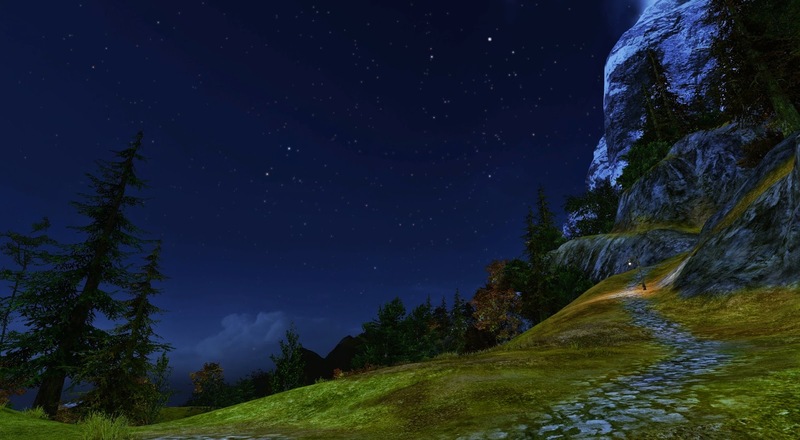 I almost mentioned in an earlier post on ArcheAge that the game appears to have no discernible night-day cycle. In the time I spent in Open beta and the post-launch sessions getting to level fourteen or so I barely noticed the sky dim let alone saw night fall. The little moon crossing the indicator in the top right of the screen tells me it's night-time but other than that it might as well be noon. That's all changed now. It doesn't quite get too dark to see but it's not far off. No wonder we need all those lamps along the side of the road. Maybe I'll start doing my public duty and light a few of them. Is it the changes I've made or is there another explanation? Perhaps night only falls once you leave the tutorial region. Perhaps it got patched in and I missed the notes. Or perhaps our shared experiences rely even more than I realized on the precise configurations of the hardware and software lenses through which we view them. If so then the degree of variation goes a lot further than I ever imagined. It's one thing to know that other players may be seeing a brighter, more detailed, more beautiful world than you; it's quite another when the difference in what you each experience is literally night versus day, color versus black and white. The moral of this story is always keep your drivers up to date - unless you prefer how things look when they aren't. The longish gap between this post and the last has nothing to do with my having become obsessed with ArcheAge. Would that it had! I have not, as it happens, spent so much as a minute there since the last time I wrote about it, for a couple of very compelling reasons that have nothing whatsoever to do with any addictiveness or lack thereof in the gameplay. First off, on Wednesday evening, when I clicked on the AA icon the thing wouldn't run. 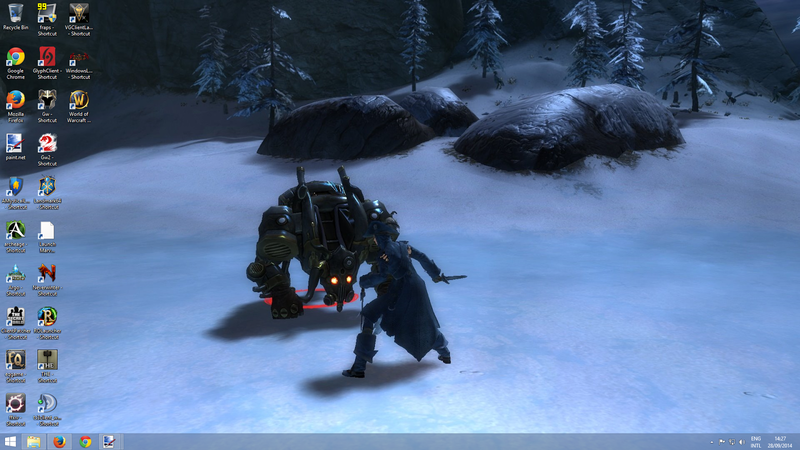 I fiddled with it briefly then decided to think about it another time and went off to wreak some havoc in WvW. When I came home from work on Thursday and switched the PC on Windows wouldn't load at all so that was most of the evening gone trying to find out why. I suspected it would turn out to be a catastrophic hard disk failure and that was indeed what it was. Given that the disk in question first tried to tell me it was dying almost a year ago and that I'd turned S.M.A.R.T. monitoring off last December when I'd decided I didn't want to listen to it bleating any more, I'm quite pleased that it lasted this long. The problem was that my version of Windows was an OEM edition of Win7 that came with the PC so I couldn't just re-install it on one of the many spare drives floating around this computer graveyard we call a home. Since I'm going to need an OS for the new system I was already planning on getting either later this year or next spring, and since I would really much rather have a nice box with a dvd in sitting on my shelves for exactly this kind of occasion, it made sense to buy a new copy of Windows rather than try to resurrect the old one through some convoluted process of recovery. I was very happy with Win7 and I'd heard so many bad things about Windows 8 that my first thought was to get a boxed copy of the old version while it's still around. After a bit of research, however, (and these days a PC failure has no impact at all on anyone's ability to browse and buy on the internet - I used my laptop but I could equally have used my tablet or my iPod Touch) I found that not only is Win7 already in the Microsoft limbo of "Extended Support" (a fine example of DoubleSpeak ) but it's also considerably more expensive than Win8. In my day job I sell books for a living. Some of them supposedly set out to help people use various computers, tablets, phones and similar devices that, in my opinion at least, already come with or have access to much better documentation than anything likely to be found in a book published 12 or 24 months ago, but hey, if people want to give publishers money for something that's readily available for free, who am I to tell them to keep their hands in their pockets? We sold a lot of books on Vista when it was the default OS installed in new PCs and laptops (my laptop came with Vista which shows you how old it is - still runs GW2 perfectly well though, which is just as well because that's what I was asking it to do these last few days - gotta get those dailies done) but when Win7 arrived there was little interest. Sales really picked up again with Win8, unsurprisingly, and as a result I have had a lot of conversations with a lot of people about its foibles, flaws and general right to exist (it doesn't have one, apparently). My overall impression has been, possibly uncharitably, that for some people the present is just an unhappy place to live. Things were always better yesterday and that even includes Microsoft Operating Systems. I listen and nod like a good customer service professional but I''m not really in that camp. I tend to think that, at least when it comes to things like technology and entertainment, the past was pretty good, the present is just fine and the future is going to be even better. So I bought a copy of Windows 8.1, which Amazon delivered in less than 24 hours, despite me not having paid for any kind of expedited delivery. Try that in the 1970s and see how far you get. It took me the best part of three hours to install it, most of the time spent swapping in and out various hand-me-down hard drives, in the hope of finding one that Win8 might find acceptable. In the end I gave up on the make-do-and-mend approach and allowed it to install itself on one of the two drives that had been in place all along, which it proceeded to do in a perfectly timely fashion. Could have saved myself a couple of hours right there. It's usually quicker just to do what you're told but that's a lesson I'll probably never learn. Win8 certainly doesn't do itself any favors on a first introduction with all the flat color and a slew of "apps" for things you know you'll never use plastered across the first screen you see. Having the "Store" as the most prominent icon probably went a long way towards stoking the anger so many new users reported. As a longtime player of F2P MMOs of course it didn't phase me in the slightest. Once 90% of the clutter was removed, some of it hidden, much of it uninstalled, the view looked much more attractive. The loudly-lamented loss of the Start Menu didn't particularly bother me. I rarely use it. In the same way I like to play my MMOs by mouse-clicking a mess of hotkeys on my hotbars I like to launch my Programs (as we ancients call them) by mouse-clicking a mess of icons on my desktop. 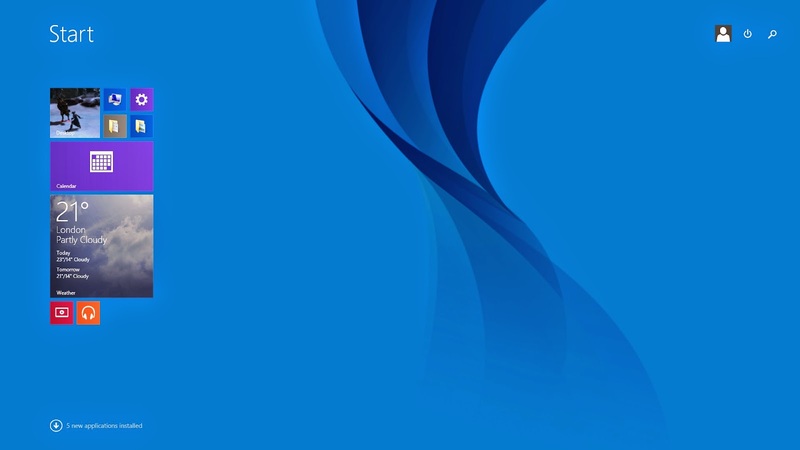 In that regard Win8 appears virtually identical to Win7. It took a few minutes to send all the shortcuts over and set up the slideshow but once that was done the whole thing looks and feels very much the same as it has for the last five years. It took less than a couple of hours to become familiar with how to get to all the supposedly "hidden" stuff , the files and folders and processes that I'd heard Microsoft now preferred we didn't touch. Yes, there are a couple more clicks here and there but last night and this morning I've had cause to fiddle with a whole load of stuff, the way you always do when you move into a new place and want to get it all set up just how you like it, and I've not found it any harder to get to where I needed to be than it was in Win7. Maybe it genuinely was harder to access this stuff in the original straight 8 release but in 8.1 I can't see the problem. Where I did have some issues was with the colors. As soon as I had the basics done I thought I'd play GW2 and leave the fine-tuning 'til morning but within minutes I had to log out and start fiddling. All the colors were incredibly muted, flat and lifeless and it was quite literally so distracting I couldn't play effectively or with any great enjoyment. Most of the rest of the evening was taken up with changing settings in Win8, on the monitor itself , and on trying to install the latest drivers. Sharper and harder-edged than before but at least there's some depth. Under Win7 I never even bothered to install AMD's Catalyst Control Center. I used the drivers on the DVD that came with the last upgrade GPU and those worked perfectly so I didn't see the point. Last night I discovered that 8.1 doesn't play nicely with Catalyst. There are a ton of threads on it all over the interwebs and Microsoft's own verdict is that it's Incompatible. It isn't, as I discovered this morning. (I gave up last night as soon as I'd bullied the monitor into displaying colors I could just about live with and spent the last two hours before bed drinking a well-deserved bottle of Merlot and defending South East Tower from NSP's repeated attempts to take it by hanging on to the coat-tails of NPC Commander Siegerazer). You just need to enable .Net 3.5 in Win8. It's not enabled by default since 8.1 uses something it likes to think of as a more up-to-date version but which AMD refers to as "unauthorised". Once I'd done that Catalyst installed just fine and after tweaking some settings I have all my colors looking bright and vibrant as I like them. I can also see a whole lot more detail, something about which I may have more to say in another post. ArcheAge is also working again although I did have to download DX9 before Glyph and Win8 would talk to each other. I'm guessing 8.1 only bothers with whatever the latest version of DX is (is it 11 now?) because new. There will, no doubt, be many more such escapades along the way as I discover by doing what does and doesn't work. I am still pondering whether to copy over my bookmarks or start afresh and whether to bother investigating and recovering what was "lost" on the failed drive or just forget about it and move on. As a rule of thumb if you can't remember you had something you probably aren't going to miss it all that much. Providing no more hardware fails this little episode probably means I won't be bothering to upgrade until next year. Another rule of thumb is that you're always better off postponing any IT purchase as long as possible because (natural disasters notwithstanding) when it comes to technology your money is always worth more tomorrow than it is today. I should get a considerably better deal in April than I will in November - fingers crossed. Until then, this hard drive failure has had unexpectedly fortuitous consequences. I now have a lot more free space on the two remaining drives (I deleted the old Image saves that took up three-quarters of my 1TB disk). I have a clean, unbloated install of an OS that I find I rather like. I have a DVD drive again (for most of the last year it's been disconnected to make room for the third internal HDD). And my games look better than before. It almost feels like I've upgraded already. Turns out this cloud was nearly all silver lining. Roger at Contains Moderate Peril offered a rebuff to Sig's post at Crucible Gaming, in which Sig made the bold statement that WoW ruined MMO gaming. Sig's post there is unusual in that it offers a clear and, to my memory at least, accurate picture of ordinary, mid-level, quotidian MMO gameplay, pre-WoW. It remains, however, only one aspect of that gameplay. Roger makes the point, very forcefully, that he approaches the MMOs he plays "from the position of single player working towards personal goals" and that he's "not primarily looking for friends or a broader social experience". This certainly sounds a lot more like 2014 talking than the common conception of the genre back in 2004 when WoW appeared, but is the coming of WoW and the passing of a few years really all there is to the story? One of the many things about the experience of playing pre-WoW MMOs that rarely gets acknowledged is how solo-friendly they were and how large a part soloists played in their communities. The history of MMORPGs mostly seems to have been written by people who were either in or aspired to join end-game raid guilds. Those people are hardly representative of the day-to-day gameplay the rest of us enjoyed. Within a few days of installing Everquest in late 1999 I was searching the internet for advice on soloing and I had no trouble finding some. Much of it wasn't very helpful, which is how I came to spend two weeks getting a dwarven cleric to level nine, but there was certainly no shortage of suggestions. The game might already have had a reputation for forced grouping but there were plenty of people playing it who didn't want to be forced. I joined a few groups very early on, mostly in Blackburrow, and decided that far from being a faster way to level it actually got me killed. A lot. In the days of level loss that risked literally sending my character backwards so I stopped. Soloing just seemed safer and for the following few months I probably soloed 95% of the time. Even when I dipped back into grouping, when I had a character leveling up in Kunark, it was something I mainly did at weekends, just for fun. Three players in this picture: one we still play with, one we haven''t heard of for a decade and one who was instrumental in our changing servers so we'd never have to play with her again. MMO communities in a nutshell. One of the key differences between pre- and post-WoW MMOs is player agency. While it was possible to solo any class to the level cap in early Everquest (there were masochists who soloed rogues, for Brell's sake!) in order to enjoy it you needed to pick the right class. You couldn't just re-make your favorite character from a fantasy novel and expect him to be able to do anything you wanted. You had to accept that the gameplay had been designed in such a way that some classes were solo-friendly and others just weren't. In short, you needed to choose the correct tool for the job. With WoW, Blizzard's designers attempted to improve on a number of the things they felt hadn't gone as well as they might have done back when they were all playing EQ. In their attempt to hand back a good deal of the agency to players that Verant, with their telling catchphrase "You're in our world now", hadn't felt necessary, they managed to create the expectation that you could pick any tool and do any job with it. By doing so they did indeed hand agency to players but, arguably, at the cost of a paradoxical lack of choice. As they say, when all you have is a hammer, every problem looks like a nail. Over time we moved from any player being able to solo to any character being able to solo and that, in my opinion, is the real root of the problem (always assuming we believe it is a problem). A lack of clearly-defined character roles, bounded by in-game rules, led to the blandness and lack of coherency from which many post-WoW MMOs have sometimes appeared to suffer. If you allow players to make exactly the character they prefer and use it to do any of the things the game offers, they will tend first towards doing the most accessible things, the things that take the least organization, and later, if asked to do otherwise, they will balk. Nothing says "Community" like an MGB. Tips gratefully accepted. At some point it must have become apparent to design teams that they were facing a choice: either produce high-end content that could easily be soloed (since that was clearly the preference of the players who had been attracted by the changes that had already been made lower down the level range) or carry on producing organized high-end content that required multiple players to complete but make the organization itself easier and more accessible. Presumably with retention and income-stream in mind, they went for the latter, which is how we arrived at automated group-finders and raid-finders, public quests, all-pile-on open grouping and the rest of the toybox of wonders that makes up a modern MMO. This decision, naturally, turned out to have its own downsides. Without a strong sense of personal discipline and a clear understanding of personal goals, a diet of easily-achieved or acquired content can pall relatively quickly. In the old days, highly-motivated, organized individuals tended to gravitate either to long-term solo play or high-end leadership roles. The bulk of players hung around in the middle somewhere, clustering together for comfort and security and, because they tended to form relationships with other players while doing so, they also tended to hang around a particular game for a lot longer than they do now. As Carbine found with WildStar the genre has undergone a cultural change that can't simply be switched off. The combination of years of accretive accessibility inside games and the growth of always-on social media outside them have brought us to a place where the bulk of the potential audience for MMOs is no longer willing to be dictated to, within a given game, over what kind of content they can and cannot consume there, while at the same time they no longer need those games to provide them with the kind of virtual social networks they used not to be able to get anywhere else. My Imaginary Friend. Players? Who needs 'em? 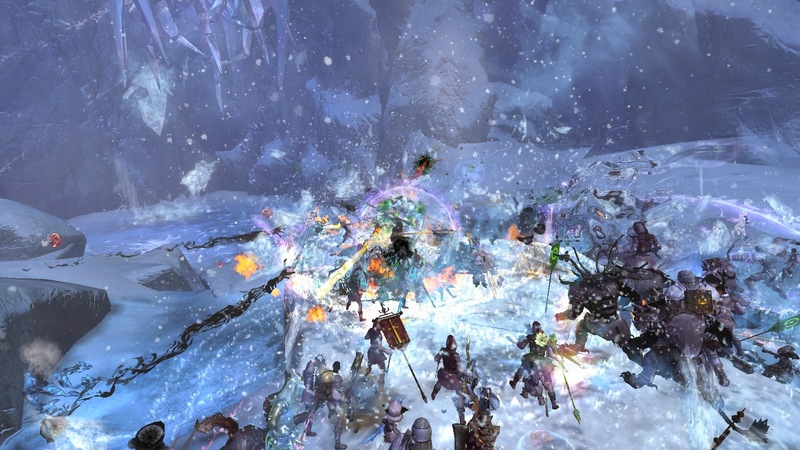 Weak demand coupled with a wealth of choice puts MMO developers in a very fragile position. It's easy for players to walk away and hard to persuade them to stick around. 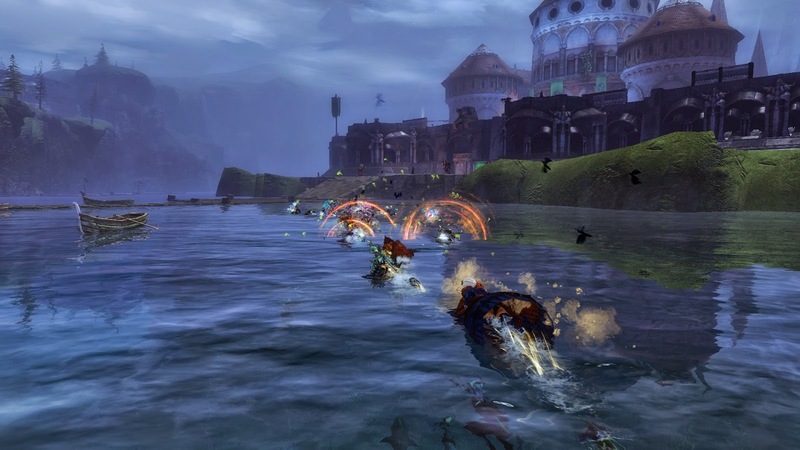 Right now, ArcheAge is attempting to go around that hurdle rather than jump over it by introducing a whole raft of activities hitherto unknown to most MMO gamers. Impermanent, insecure personal possessions. Predation. Vulnerability. Risk. To survive and prosper in AA the current thinking is that players will have to co-operate, form communities, make personal interactions with other human beings a part of their day-to-day routine. Whether this will prove any more attractive, long-term, to a mainstream MMO audience than WildStar's failed, attritional, grind-to-raid end-game remains to be seen. My feeling at this point is that both games employ a remarkably similar light, bright, fluffy wrapper to hide a very spiky, unforgiving core and the end result may not be all that different. 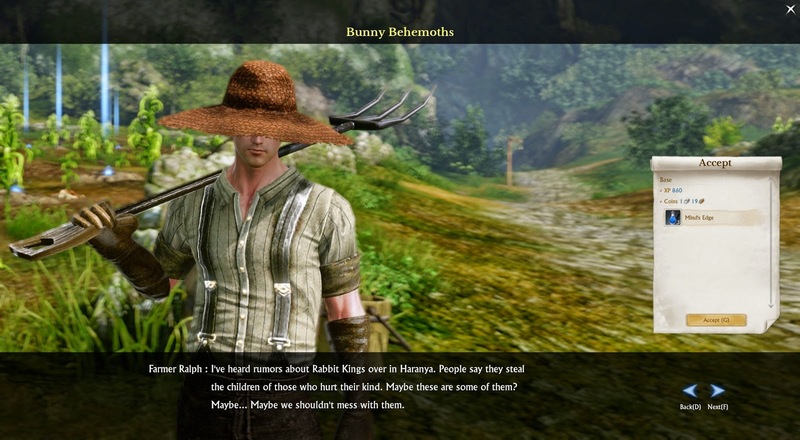 Still, if nothing else, ArcheAge and the publicity that has surrounded its seemingly successful launch may at least introduce a few modern MMO players to some unfamiliar concepts, not least among them teamwork, co-operation, awareness of your surroundings and the outside possibility that you just might not get given everything you want just for turning up. Sometimes you might even miss out altogether. I don't suppose it's going to bring back the kind of List-based camp grind gameplay Sig recalls. I bloody well hope not! It might, though, prepare the ground for a few new twists and wrinkles to the gameplay that has staled over the long years since WoW seemed such a fresh breath of air. Let's hope so. At 10pm last night I decided I'd been patient enough. 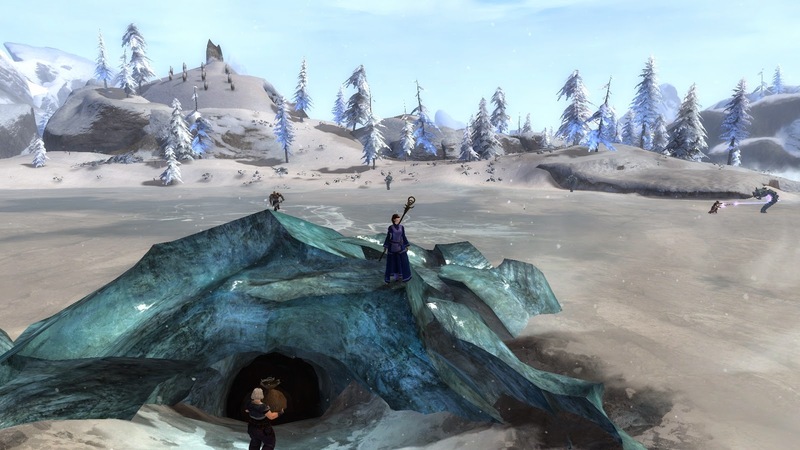 Trion had brought a third additional North American server online. It was a weekday, still not quite prime-time in the States, and it seemed there might be a chance of getting to Character Create in something under an hour. There were around 250 people ahead of me; a huge improvement over the two and a half thousand I found on the least-busy server last time I tried. Even two hundred and fifty sounded like an awful lot but the queue just melted. I was first in line in just over four minutes. 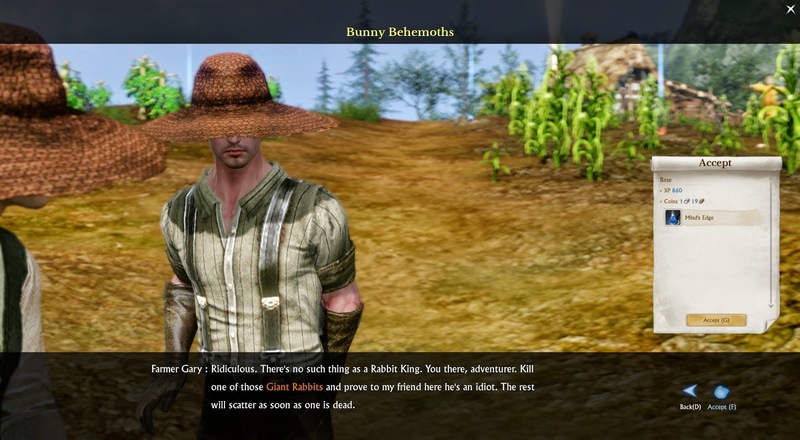 Character creation in ArcheAge is weird. The range and depth of customizations available for every aspect of your character - above the shoulders - is possibly the greatest I have ever seen. There's a wealth of hairstyles and shades, flesh tones and eye color. There are sliders for just about every imaginable cranial dimension. There's a wide choice of make-up, lip-gloss, scars, and disfigurements. There's even an excellent selection of aging and weathering effects, allowing you to make your character look like anything from an ingenue to a dowager. All of this for the head and absolutely nothing whatsoever for any part of the body. Your lovingly detailed, personally specified physiognomy is bolted onto a stock frame from central casting and that's that. Consequently I have a rather more buxom country wench than the typical, undernourished cellar-club habituée I favor. 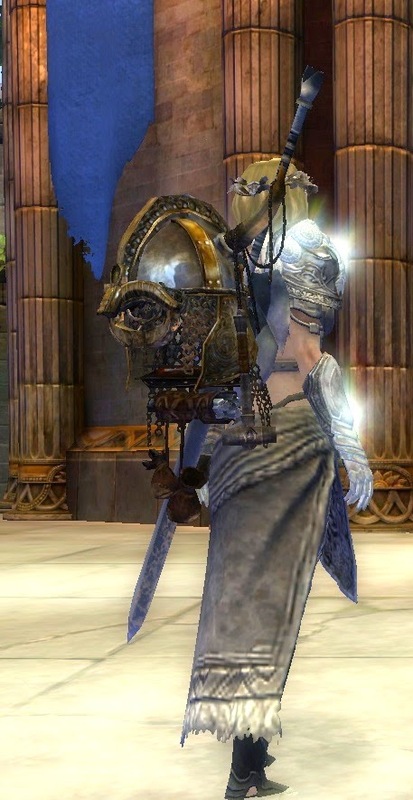 If there's any rational explanation for this seemingly bizarre design decision I can only imagine it relates to a desire to maintain uniformly-sized hit boxes for PvP purposes, although how that's going to work when/if XL ever gets around to adding the long-promised Dwarven playable race I can't imagine. Maybe they'll be very tall dwarfs. Even though I did my best to exhibit some restraint, by the time I finished fiddling with the sliders and stepped out into the world, (does it have a name?) it was time for bed. Play resumed around lunchtime today, when, being the middle of a mid-week night across the ocean, there was naturally no queue whatsoever. No queue very definitely doesn't mean no players though. The Nui starting area was heaving. This time, rather than run off and explore as I did in Open Beta, I stuck to the suggested agenda and did my quests. All of my quests. Last time I didn't get a horse and I didn't want to make that mistake again. The tutorial tooltips in AA are, by and large, quite useful. They're certainly reasonably accurate. All except for the one about getting your first mount that is. When that one popped up, somewhere around level nine, to tell me that somewhere around level ten I might start thinking about finding a ride, I'd already been cantering the countryside hither and yon for three levels. Much has been made of the initial quest for a horse, with various bloggers gushing and goshing over the originality, excitement, unexpectedness and general all-round magic of getting a mount that you have to feed and play with and brush and generally raise as if he was real. These bloggers clearly never played Free Realms. 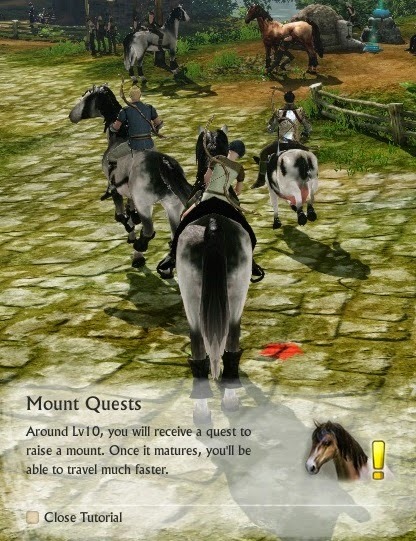 ArcheAge's horse quest is pretty much a postage-stamp sized edition of the Pet Trainer job from that much-missed MMO. Pet Trainer was just about my favorite Free Realms job so it was lovely to return to it. Shame it had to be such a short visit. There's an ominous in-game warning that if you neglect your horse-rearing responsibilities the poor thing may keel over after an hour or so. Fat chance of that. Taking your tiny foal up to seventeen hands of strapping grey stallion takes a couple of minutes, tops. 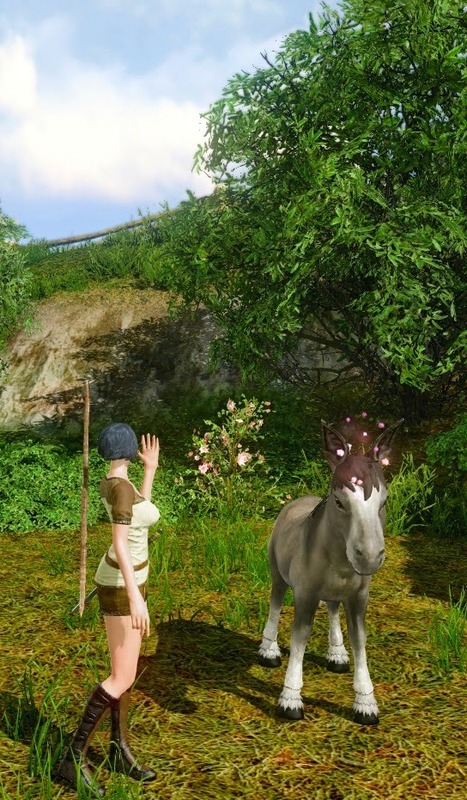 Horses in ArcheAge are pretty horselike. The proportions look about right and they move nicely so long as you go in a straight line. The jumping animation is more of a bunny-hop and you won't be winning any dressage medals when you strafe but overall it feels convincing enough. The hoof sounds are a bit metallic, not to say annoying, but at least there are some. Speaking of sounds, the audio in ArcheAge isn't at all bad. The opening music sounds astoundingly like the main theme from City of Steam, which is welcome if a tad disconcerting, although ufortunately after that it's back to the usual Enya-lite you'd expect to hear in an elven elevator. The most impressive audio moment by far was the thunderous roar as Thunderbird 2 an airship passed close overhead. I actually thought it was a lorry parking outside my house the first time it happened. 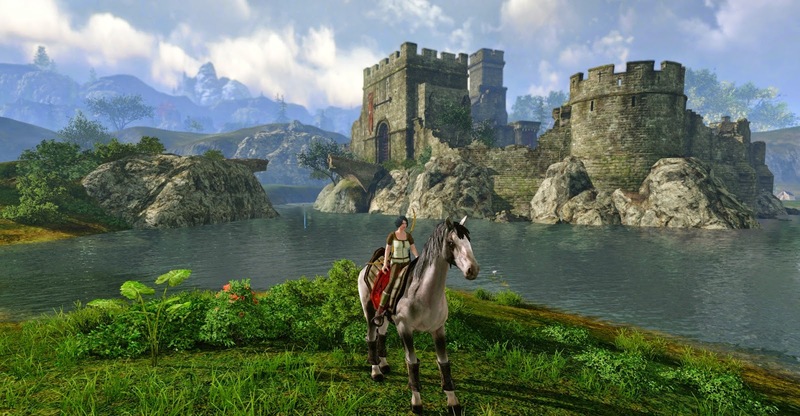 Going back to the questing, ArcheAge, much like Rift before it, has been taking a lot of stick for blandness in that regard. I always felt Rift's quests were better than people gave them credit for, being certainly no worse than the MMO average (not that that's setting the bar so high a gnome couldn't walk under it without taking his hat off) and ArcheAge seems there or thereabouts the same. Yes, the questing is generic but the quest text is snappy, there's some humor (albeit labored and heavy-handed) and it looks at least as if someone has put some effort into fleshing out a little backstory here and there. I toddled around for two hours questing until I hit level ten and it was pretty fair entertainment. The quality of the questing experience may be a matter of opinion but the question of whether mobs can or cannot drop useable equipment is a matter of fact. Contrary to what you may have read elsewhere they most definitely can and I have the photographic evidence to prove it. I was killing Four Fingered Thieves (you can guess how they got that way) for a quest and collecting their Brown Hood quest items as they fell when I was surprised and delighted to see a flash of red in my loot window. 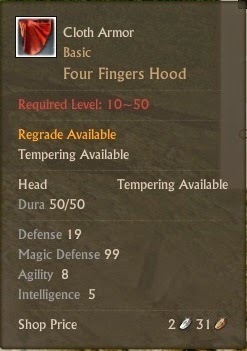 One of the thieves dropped a "Four Fingers Hood" which, on examination, turned out to be an equippable face-slot item. Yes, it had poor stats compared to the quest item I was wearing and yes, it was required-level 10 and I couldn't put it on - yet - but it was, indubitably, mob-dropped, wearable armor. That one drop removes my single biggest objection to ArcheAge. I love getting stuff off mobs. I actually prefer it when drops are rare enough to come as a surprise, too. Even if it happens once in a blue moon, just knowing it might happen makes every kill a thrill. Another box I like my MMOs to tick is open-world Nameds or Bosses or whatever you like to call them. Nothing like roaming the wilderness and coming face to fang with an oversized beast with a non-generic name. "How tough is he? Could I take him? Can I afford to prep or will someone else KS me if I dither?" The thoughts that race through your mind the moment you spot a target of opportunity - for me that's a big part of what MMOs are all about. And ArcheAge has them. I ran across a very large crab on the Bloodhand beach. It had a name but I was too excited to notice what it was. Several people had already engaged it and I was fearful of missing out so I spurred my mount into a gallop across the white sands and leapt off as we came within bow shot. A few seconds later I was reviving some ways down the strand and my poor horse was horsemeat. The crab was still skedaddling up and down the shoreline when I headed off into the interior on foot and, presumably, carrying my injured horse, in search of a stable where someone might know how to fix him up. How many newbies it takes to kill a 3/10 star boss is something I'll have to find out another day, (it's more than half a dozen, apparently) along with what, if anything, you get for winning. Eventually my hunger began to tell me I'd be playing for too long and I looked for the next quest hub along the trail to camp for lunch. Climbing up out of the farmlands behind the coast the leaves on the trees began to change color. Autumn comes earlier inland it seems. Behind the next village lowered an impressive snowcapped mountain range. I'm still not completely convinced that the World of ArcheAge (what IS it called?) is quite as genre-shatteringly beautiful as some claim but it's certainly pretty enough. My labor points have so far accrued unspent. I'm content to quest and explore for now and let them build up until I have some idea what I might want to do with them. Much of the chat in-game seemed to revolve around farms, houses and how to acquire them but to be truthful I can't summon up much interest. Call me a traditionalist but I kind of want to be an adventurer not a farmer or a traveling merchant. Early days, though. It's not all that often that the view of an MMO at level 10 bears much resemblance to the view from level 50. I'd say there's a better-than-even chance I'll get that far. Might take a while. What happens after that remains to be seen. Of all the changes that came with the Fall Feature Pack the one that seems to have been an unmitigated success is the Liberation of the Minis. 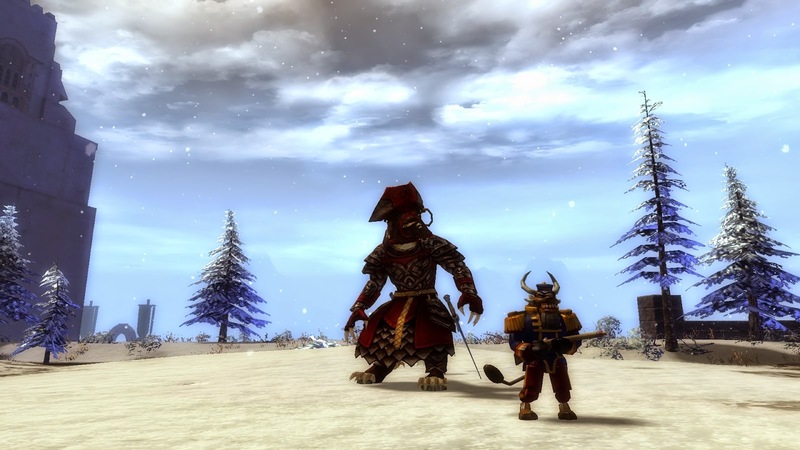 Where other MMOs have vanity pets the Guild Wars franchise has Miniatures; knee-high (or shoulder-high if you happen to be an Asura) copies of mobs and NPCs. It's a great idea but the original implementation, up with which we have had to put for two whole years, was dismal. You needed to keep the Mini in your bag and re-activate it every time you changed map. On top of that, Minis had a tab in the Materials section of the bank, which meant that if you forgot to put one of your many Queen Jennahs in your Safe Box or Invisible Bag then the first time you hit the "Deposit All Materials" button to clear your packs of copper and green wood, off her royal highness would fly to a bank slot on the other side of the world. All in all it was just too fiddly to be fun. 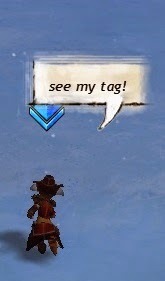 Unlike in EQ2, where I often travel around pursued by a duck or jelly mound desperately trying to keep up with my unfeasibly speedy mount, in GW2 I rarely bothered to "have a mini out" as the jargon has it. That's all changed now. The new implementation, which is blindingly obviously the way it should have been from the start, sees a mini, once summoned, stick with you from the jungles of Maguuma to the snowfields of the Shiverpeaks. Their new state is so persistent they even re-appear beside the character who summoned them each time he or she logs back in. The slight downside is that they are now one-time consumables incorporated into the wardrobe system rather than permanently tradeable items. They have become account -bound on use, although they can still be freely traded provided no-one actually uses them, and they also have a test-drive function, whereby you can have a good look before you commit. I can live with that. Happily. It's jolly to see all the strange little creatures milling around. They look particularly, charmingly, out of place in WvW, where a Princess Doll and a Candy-Corn Elemental hardly fit the theme of eternal internecine warfare. 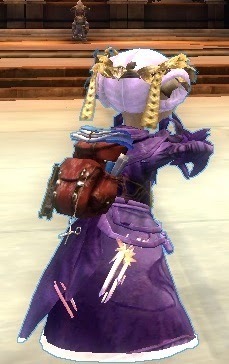 It was in WvW, at Askalion Hills Keep (our spare Hills to be precise, the one we keep on SBI's borderland for convenience) that I discovered something about minis that I didn't know. They can talk. Well, one of them can: Evon Gnashblade. Scared the bejeezus out of me when his gravelly baritone ground out "I was the favorite". He still hasn't got over that rigged election but then neither have I. I had to tab out and check the Wiki to reassure myself I wasn't having a psychotic episode. Whether he's the only one that talks I'm not sure. I hope not. Persistent, talking minis ares something I could definitely imagine making some effort to collect. When I log in to GW2 of an evening first I like to get my dailies done. They're easy and satisfying and they serve as a nice wind-down after work. When they were introduced, way back when, dailies were the same every day and I got into the habit of doing them all in Plains of Ashford. After a while they changed things up so that every day's five permed from ever so many and I moved my base of operations to Wayfarer Foothills. On a good day there you can do the entire daily in fifteen minutes without going more than a few hundred meters from Krennak's Lodge. The Frozen Maw, the World Boss event that runs every two hours, is often good for the full five. Post Megaserver, with a guaranteed zerg, the Maw offers some of the least challenging content imaginable but it's also among the most profitable. I was estimating the other day that I must have done the Maw event well over two thousand times by now. I do it twice a day, minimum, every day without fail; once on each account. Most days I do it three times and on a Saturday or Sunday I might stretch that to half a dozen. I therefore have a lot of data to draw on. Excuse me! You there! Charr! Can you see my Rares? 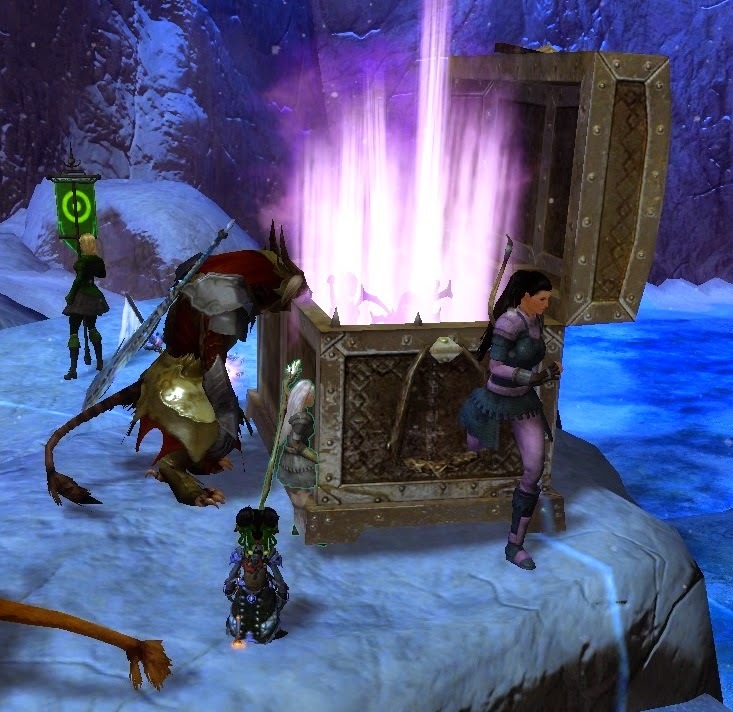 Oh why did they have to make this chest so darned big?. I began to notice the Shaman's unusual generosity sometime around last November. I started watching my drops very carefully after that and in almost a year I have never, not once, failed to receive at least one Rare in the big chest on the ground. As far as I can ascertain Frozen Maw is the only scheduled "World Boss" event that gives a Rare quality item every single time. Often it coughs up two or three.Why this is, whether it's intended or a favorable bug, I have no idea. I just enjoy nature's bounty while it's there. The Maw has been through many changes, its popularity swinging wildly. There was a time when it generated its own single-server zerg and for a while, just before the arrival of Megaservers, it had fallen so out of fashion that I often found myself doing the event with just two or three other diehards. It even failed on occasion. Try telling the young 'uns that now. They'll laugh in your face. I preferred it that way if I'm honest; kiting the Shaman round and around, sending in bears to hold him steady so he wouldn't tether and reset. There was risk then and reward. Now there's just reward. Still, better that than the other way around. I'm off to the Mists. Want to come? Anyway, that's by-the-by. Tonight I chose not to do my Daily in Wayfarers but to go to WvW where, in a decent KTrain or just following a commander who knows what he's about, you can knock off the daily in ten or fifteen mindless minutes. 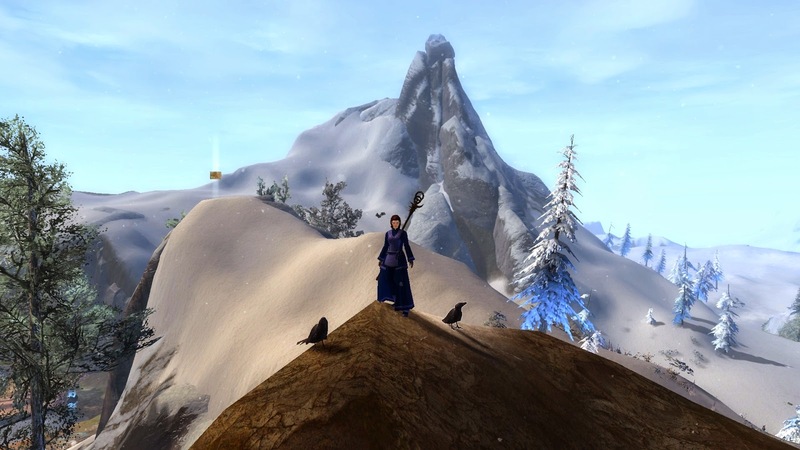 Other than the current compulsive, competitive frenzy of a WvW Season or the first couple of days after a Living Story episode, or when I'm leveling up a new character and occasionally need to pay attention, this is mostly what GW2 has become - a repetitive pleasure that often bears more resemblance to chanting a mantra than playing a game. I'm not complaining. If I wasn't enjoying myself I'd stop. After two years, though, it's really no longer enough to hold my attention full-time. My mind tends to wander. I tab out. I blog. I comment. I browse Amazon. I check the weather. Sometimes I even I dither around in other MMOs. In-jokes are so funny, aren't they? That's how it came about a few days ago that I logged into DinoStorm for the first time in a while. The game seems to have been doing just fine without me. It's still busy, still getting updates. It's amazing how many MMOs seem to manage to struggle along, somehow, even without the attention of bloggers and news sites. It's almost as if there were other people out there, enjoying this hobby, about whom we know nothing. Crazy talk! These last couple of days I've returned to City of Steam too, an MMO that once, indeed several times, gained significant traction in this corner of the Blogosphere, only to lose momentum and slip out of sight. Well, that one's still going too. Also still busy and getting updates. This month they even added a new European server. Another MMO that doesn't seem to care that we stopped paying attention. In fact it's beginning to look as though just because no-one reading this writes about an MMO any more doesn't mean it fell off a cliff after all. There are hundreds of MMO(RP)Gs out there but we, the iterative subset of bloggers that feature in blog rolls and rss feeds of blogs that feature in blog rolls and rss feeds, focus on a mere handful. WoW, GW2, ArcheAge, EVE, EQ/EQ2, LotRO, WildStar, SW:ToR, TESO, TSW ... if I listed the entire roster of MMOs regularly discussed in this part of the forest would it amount to more than a couple of dozen? I doubt it. Oh yes, they're positively hysterical. 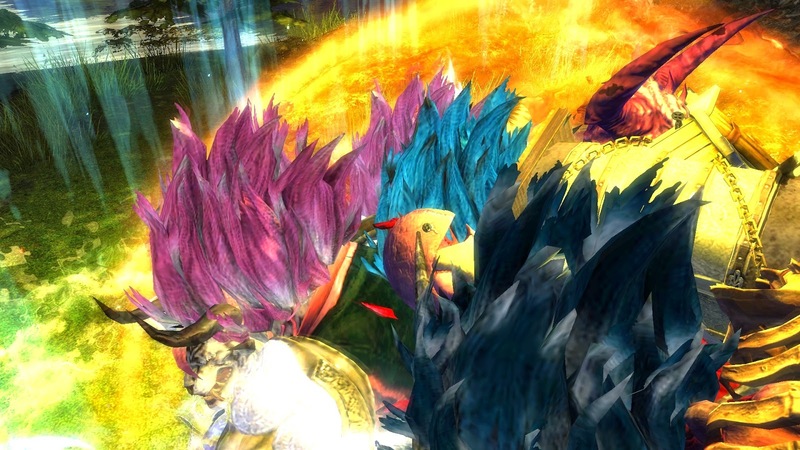 There trouble is, there are more MMOs out there than most of us will ever hear about, far less play. Few of us can be Beau Hindman, bravely, forlornly, attempting to play every single MMO ever made. Based on his recorded experience, few of us would want to. It sounds like a grim life. Even among the MMOS we do get around to trying most don't stick. They slip out of our grasp somehow. The list of MMOs I have "played" is long. Over a hundred. I wrote something about that once, come to think of it. I must get around to Part Two sometime... The list of MMOs I'm still playing, even as infrequently and sporadically as DinoStorm or City of Steam, is much, much shorter. Yesterday Syp posted a great summation of why The Secret World should have been huge. I've been hankering after some TSW for a while now and Syp's piece was enough to make me patch it up. The download was over 2GB. Shows how long it must have been. Syp and several other bloggers I follow may still play the game and I may be itching to give it another run but TSW, the unpleasant fact remains, was not huge. Whether it was the gameplay, the payment model, the timing... who can say? Whatever it was, TSW did not turn the genre on its head, more's the pity. Half of them are people who won't quit it with the in-jokes. exemplary and so is the world-building. If you're willing to allow voice-acting in MMOs then TSW is the gold standard and then some. In so many ways there just aren't any better MMOs than TSW and yet it failed to find an audience large enough to match its ambitions. I didn't help. I didn't even manage the statutory three months. Thinking of MMOs I admire but don't play as often as I ought brought me to Project: Gorgon. I patched that too and checked on the progress of its Kickstarter. There's good news and there's bad news. The good news is that P:G has updated five times this month alone. Following on from yesterday's patch-note-oriented post I'm pleased to report that Eric Heimburg's notes are comprehensive and amusing. More importantly they confirm that this is an MMO that's undergoing a degree of continual development that many big budget games could only envy. *cough* Landmark *cough*. The bad news is that, with just a week to go, the Project: Gorgon Kickstarter has yet to hit 20% of its target. I encourage everyone reading this to go pledge because solidarity is a good thing but it looks as if there is simply no way this KS will fund. That's bad news for Eric and his team but, if it means the end of development for the project, it may be even worse news for us, the audience. Damn! This is mini-Maw again, isn't it? Project: Gorgon is a Vision Game. The people behind it, like the people behind Ever, Jane, Camelot Unchained or Fallen London are making the games they want to play, not games they think will make the most money or satisfy the demands of the most focus groups. That is what creative artists and writers do. There are no good reasons major studios can't do the same. Art does, on occasion, emerge from global, corporate publishers, record companies and film studios. It can be done. Mostly, though, it isn't and until we see some evidence that the big gaming houses are willing to step up to that mark we had better learn to cherish the little guys who do. It may be too late, again, for Project: Gorgon the KickStarter but I really hope it's not too late for Project: Gorgon the game. Build it, Eric, and they will come. There may not be many of them but it might just be enough. Keep the faith as Stan Lee used to say. There's an audience out there for just about anything if you can only find it. After all, if DinoStorm can do it, anyone can. The Game Update Notes for the Fall Feature Pack that arrived last week bordered on the epic. I fancy myself an aficionado of the form; someone who, not infrequently, visits websites to research and ponder upon the classics; a veteran of the glory days of Everquest, when we'd pore over each enigmatic entry with the focus of a haruspex examining the entrails of a freshly-slaughtered sheep. Even I, however, balked at this Gilgamesh of game changes. As if the initial torrent wasn't sufficient to drown us in confusion (and map chat and the forums certainly suggest it was) ANet saw fit to shake the fire-hose no fewer than nine more times. Every day is patch day this September. Fixed a bug that prevented some accounts from having vistas now unlock on an account-wide basis rather than a per-character basis. Skill challenges now unlock on an account-wide basis rather than a per-character basis as originally intended. This bug affected some but not all accounts. The bug prevented Vistas from unlocking for all characters on the account. Vistas are intended to unlock for all characters on the account. This is the status quo. (implied). Vistas formerly unlocked per character. This was the status quo ante (implied). The second entry confirms that the same state-change that has already been made to Vistas has also been applied, presumably bug-free, to "skill challenges", which I take to be what are generally known as "skill points" in our house. If they aren't then I have no idea what they could be. Now, if (and it's a very big "if" because I am far from certain I understand what's going on here) that's what these notes mean, then it would represent a major change to gameplay. Vistas and Skill Points are both intrinsic parts of Map Completion, which has always been "by character", much to the disdain of many, although I don't include myself among their number. I would guess that it would be quite feasible, nevertheless, to transfer vista unlocks to ownership of the Account without upsetting too many people or breaking too many systems. 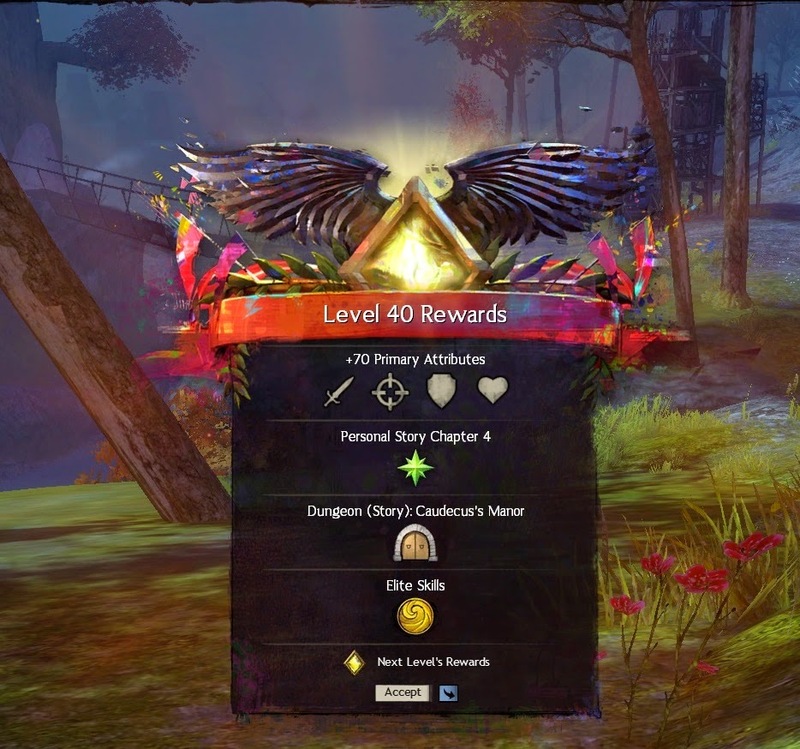 Skill points, however, are not only required for Map Completion but for direct character development while leveling up and as an important form of currency for a number of late-game activities. Granted most skill points at that later stage come from the ever-rolling level counter and those nifty scrolls that Champs drop but even so to move them from character to account would seem problematic to put it mildly. Well, it seemed easy enough to test so I tested it. First I checked two characters on the same account - my most map-completed and my least. Had the latter acquired a hatful of vistas and skill points overnight? He had not. Change not retrospective then. Next I found two characters neither of whom had done a particular vista, the one by the steam bath in the Norn starting area, Wayfarer Foothills. I climbed the hill and opened the vista on one character then logged in the other to see if he had magically received credit for a view he'd never seen. He had not. Conclusion: either its still bugged or I have completely misunderstood the patch notes. Having trawled both the official forums and Reddit for comments and opinions on what would be, if it were true, a highly controversial change to the structure of the game and having found absolutely no mention of it whatsoever I have to conclude that it's the latter. The only grasping-at-straws idea I can come up with is that these are changes somehow related to the NPE and therefore only affect new characters leveling up under those rules. I don't have a new character to hand to test that right now but in any case it seems highly unconvincing as a possibility. I have to conclude that I'm baffled. If anyone has a clue what's going on perhaps they'd care to explain in the comments. Reason: GW2 World vs World Season Three. The match began at reset Friday. 2 am local. My contribution? Fast asleep in bed. Probably some snoring. Saturday morning I woke up, made breakfast, logged into MOSMillennium on my iPOD Touch, hoping ANet hadn't pulled any last minute surprises but no, everything was fine. There we were, safe in Silver. Phew! Back from work, too many hours later, I was able to log in at last and head straight for our Borderlands. Six hours later I looked up...where did the evening go? Sunday was much the same only more so. It's been fast, frenetic and fun. Tactics have completely changed, from last season and from YB's normal pattern. We don't seem to be bedding down, sieging up and holding stuff the way we usually do. Huge zergs tear around like over-sized havoc groups, assaulting everything. There are pitched battles everywhere. We still have golem rushes but now we have crash-builds too. Eight guild catapults up in seconds on a wall. Five superior rams on a gate. And that's just for a tower. We had ten trebs hitting Bay from south-west camp at one point. Ten! Some of this is down to changes in the mechanics. The new siege traps that render siege unuseable for 45 seconds have already dictated a new approach to placement. Many siege engines strung out in a line instead of a few clustered together. If traps catch much of the siege we pound on the door until the rams start up again or we just abandon it and charge on to somewhere else. Mechanics aside, most of the new approach is, I think, down to personalities. 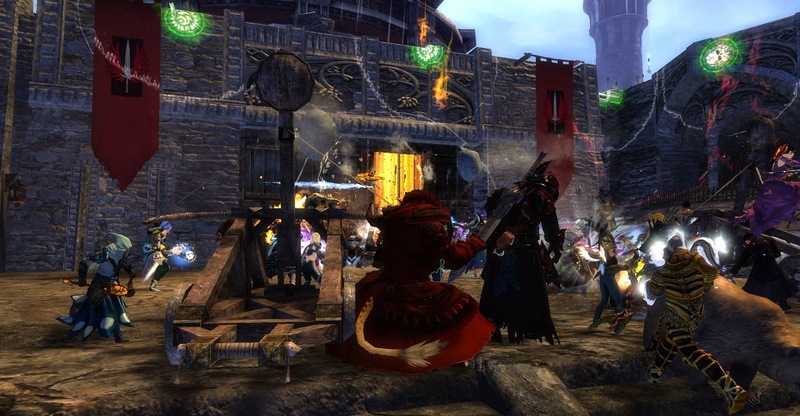 Our new, dominant WvW guild is fast and organized, burning with energy. They complement our steady, established order perfectly. While they wreck around Eternal Battlegrounds and the enemy Borderlands our familiar Commanders fortify the homelands or arrange to hold what's been taken. We haven't entirely given up our old ways. On our home Borderlands yesterday we were at siege cap most of the day . People had to be told to let some of the trebs decay. Fears that the drastically reduced achievement requirements for Season Three (they can be completed in a matter of minutes and you can do them all in Edge of the Mists if you want) would lead to a complete non-appearance of the PvE militias seems unfounded. We had queues, often, across the weekend. Spies and saboteurs are up to the usual tricks, draining supply and strolling golems off of cliffs. If we get Stormbluff Isle next week, as seems likely if I understand the revised Swiss system correctly, things could get ugly. With the short format and freedom to transfer there will be carpetbagging too. Yak's Bend, unexpectedly successful runners-up in two longer, harder seasons before this, look a fair bet for first place this time, although the entire Silver League looks drum-tight. We may yet be bandwaggoned if we look like winning. I hope not but I already see a lot of unfamiliar names and guild tags. Following the ranger revisions in Tuesday's patch and on hearing that the supposedly broken class I've happily played since beta was now uber I took a long look at my spec. It did not stand up to scrutiny. Not because there was anything inherently wrong with it. I'd wanted a condition damage ranger and I'd made a condition damage ranger. Thing is, I never play as though I'm playing a condition damage ranger. Can't we use that boat? I hate getting my fur wet. I re-traited and re-geared for burst damage and survivability and so far its a major improvement, just as it was when I finally cracked and rebuilt my Elementalist as a pure zerker. Sometimes it just doesn't pay to fight the meta. Now if I can just stop barrel-rolling into enemy zergs I should be fine. ArcheAge opens for F2P scrubs tomorrow and I'm keen to get started but it may have to wait. Although if the Season carries on at this pace I might need to head there for a while just to catch my breath. 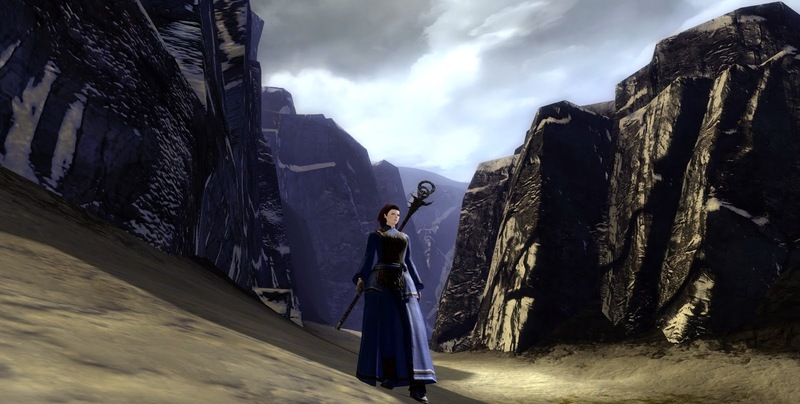 This week's Feature Pack for GW2 fell at an awkward time for me to make a thorough examination and assessment before penning a pithy post on its benefits and shortcomings. Fortunately Jeromai and Ravious have both found time to give it the once-over in some detail. With luck and a following wind I may find time to give a more considered impression later although the upcoming World vs World tournament may have something to say about that. Whatever, we're certainly going to be chewing on this Feature Pack for some time given the unwelcome announcement that we'll see no more Living Story this side of November. For the meantime I do have a few scattered thoughts. Crafting and Backpacks : Undoubtedly the standout feature of this update and quite possibly this year. Being able to click through recipes to their sub-components is a joy. Of course it's also a feature that most MMOs include from the start but better two years late than never. There are forty new backpack designs, all different. They are all extremely cheap and easy to make. Mrs Bhagpuss made all forty on the first evening. Some are the exact type of realistic, practical-looking affairs I've longed for since beta, others are utterly insane. Something for just about anyone. Now can we have some decent hats, please? Collects : Good framework for future development. Deeply uninspiring use of said framework so far. Trading Post 2.0 : Embarrassing attempt to sell the addition of basic features that should have been there in beta, like a proper search function, as "upgrades"we should all be gosh-wowing over. New interface is clumsier and harder to navigate than the one it replaces. New back-end does not appear, as claimed, to be faster to access and use. Selling things is now particularly painful. What used to take me a single click now takes several. The lack of a single-click "sell stack" option is physically painful. Commander Tags : A hideous blot on the landscape! We are now in desperate need of a "Do not display" toggle at least in PvE. I cracked and bought one last week but only on one account. Don't judge - it was a bargain! Minis : Embarrassing attempt to sell the addition of basic features that should have been there in beta, like cross-map persistence, as upgrades. Still, better two years late than never. I'm beginning to sense a theme here. Class Changes : My eyes started to blur half way through the patch notes for the second class. Frankly, who cares? It's not like I knew what most of this stuff did before. Why would I start caring now? I play all the classes and I was happy enough with each of them. I do quite like the marginal extra control over summoned elementals, although I'm pretty sure it's mostly cosmetic. I was in Wayfarer Foothills for my usual couple of hours last night. It's the Norn 1-15 map and since Megaservers arrived last April the conversation there has mostly been cheerful and upbeat, mainly new players (of whom there appears to be no shortage) asking questions and getting helpful replies. After the patch that changed to a non-stop rolling debate about the changes to the leveling process. Suffice it to say I did not hear a single positive comment in two hours. Established players hate the changes because they perceive that they make leveling both slower and more tedious. New players, from that sample at least, hate the changes because they feel they are being held back from getting to the good stuff and treated like incompetent children to boot. I don't have a really low level character, nor a free character slot, and even if I did I don't have time to level one up right now. I'd like to reserve judgment until I give it a go but on paper it does look like a very odd way to address the perceived problems. It transpires that the port of these new functions from the Chinese version has glitched somewhat and the version we are seeing has a number of bugs. Colin Johansen posted a long, detailed and very interesting explanation on the forums, where tar and feathers were being readied and torches lit. By the time I get to try out the NPE it will probably already be the New NPE. As things stand I very much agree with both Ravious and Jeromai that the NPE represents a significant shift away from the Explorer paradigm GW2 started out with. It also indicates another strong move towards a much more traditional themepark approach. I think ainekitten on the forums sums it up beautifully in his elegant and heartfelt comment. Anet thanked him on his feedback. I hope they also take it to heart.